The Baracuta Bone Saw from Havalon Knives is a unique, revolutionary saw blade capable of any size job. Introducing the latest innovation from the makers of the world’s sharpest hunting knives, the Havalon Baracuta Bone Saw. This unique Bone Saw is made from Havalon’s proprietary blend of steel that creates a strong, durable, blade with unmatched sharpness. This precise saw pattern has been perfected over years of research to provide the best combination of durability and sharpness that is needed to cut through the bone of any size game. The most beneficial part of the new Baracuta Bone Saw blades are that if you need a new blade or are ready to move on to another task, you can pop the blade off and replace it with another Bone Saw or one of the other Baracuta style blades. The Baracuta Bone Saw blades are available with a handle or in replacement blade packs if you already own one of the other Baracuta handles. Havalon Knives began in 2005 with the release of the Piranta series of skinning knives with Quik-Change™ blades. Havalon has since become popular with hunters, trappers and taxidermists due to their true surgical sharpness and extremely light weight. 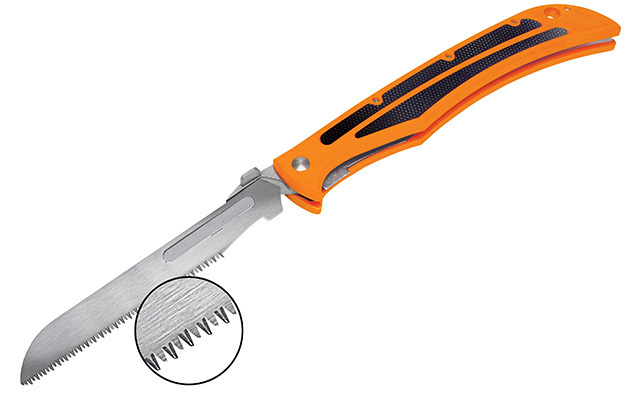 Havalon’s replaceable blades eliminate the need to carry heavy skinning knives, sharpeners and whetstones into the field.